Ellen Keir Bobseine is a gifted YogaDance instructor who teaches people how to “shake their souls" through yogadance, jazz, and more. However, she didn't have any sort of branding... a logo, business card, anything to publicize her classes. Ellen's favorite colors in the world are bronze, sage green, and eggplant, but she didn't know how those could be used in her new "look." When she met with me, she was wearing a scarf with those exact colors in it, so I had a quick brainstorm... what if I just scanned her scarf and used that as the basis of her new branding? 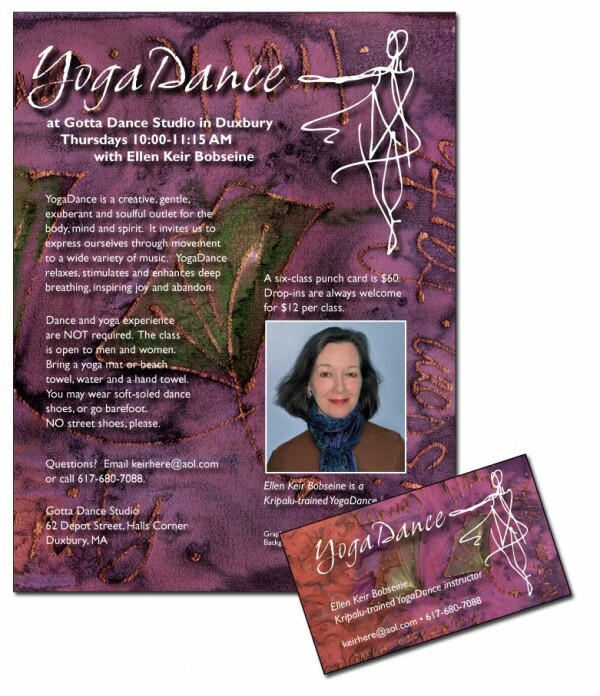 Here is Ellen's new look, which she loves, and her flyers around town have gotten her a lot of dance clients!